This topic is to post here you old avatars so they never get lost. Also you can talk about avatars here. 2) You need to be a active and mature member to post in this topic. 3) (Optional) Tell a thing about you avatar , or why did you want it. ---I didn't have a avatar , so i asked for one in the "Making 0'games avatars' thread. ---I didn't like the old avatar to much. So i asked LightingFire to make me a Pony avatar, and so FP was born. ---I asked LF once again to make me an pony avatar , because i wanted one that animates more. --- I SAID NO FUN ALLOWED !!! ---My OC from the wallpaper Jorichi made. --- A special avatar, cause i got 1000 posts. --- Crash Bandicoot is just awesome ! ---I completed Legacy Of Goku II, so i decided to have a DB avatar. --- I didnt have one so I stole an image off of some one else and made it into a meme. Ta-Da. --- My first ever art on MyPaint. --- Added a bit more text to spice it up a bit. --- I name it "Mario Hater". --- An animated version of my 2nd avatar. Too big for SYS forum. --- It is my pony OC. I call it Golden Pegasus. --- supermarioportal2 liked my old avatar, so I changed it and Mari0-fied it. --- Big thanks to LF for making this. --- My pony OC, but this time not a recolor. --- Since I changed my user name on this forum, I decided to make a quick avatar. --- Oh god no, NO FUN ALLOWED. --- And then Game Grumps, not my favorite scene of the show but it's kinda the easiest to do. --- Got this one from an accident. --- Fapping Mario: I was playing Mari0 and I came across this. Being the immature f*ck I am I automatically switched to it. --- Large invisible block: I reverted back to this when everyone mistook me for Maurice. By the time Maurice got rid of that picture, I was feeling attached to this one. Probably here to stay. --- my current avatar, I got a pic of tim, a pic of a portal gun, and fitted them together. had to erase some of his arm. --- I needed a new avatar. so I went on TSR and made a GIF of one of his getting hit frames. ---I really wanted an avatar without Tim for once, but spinning Ryu wasn't good either. ----As you all know, I love spinning avatars. So I made another one. Firaga fixed my avatar. --- Look to the left. I was feeling jolly! ---Decided that I'd use this old avatar for a while! ---Time for me too drop off my crap! ---I used Scott Pilgrims Sprite as a Inspiration. --- My one now, I used paint.net to edit it and make it have I LIKE TRAINS! and a BONKO! GIF. --- My first one ever. Simple. --- I found this of VVVVVV's official site (or music site), and used it. ---My first *almost* custom sprite I made. I also used this one for a while. --- Stolen Borrowed from the SSBB 2014 thread. --- Pokemon avatar. I actually made it a month ago, but decided to have it as my avatar for Stabbymon. 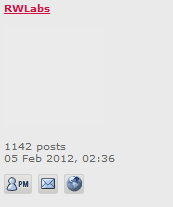 --- A throwback to the old avatars of the Stabyourself.net forums. -- And I guess while am at it, I'll post my new avatar. -- Something I drew because why not. I needed an avatar, so I made this one. Got bored and made another of me playing SH. An animated version because WHY NOT? My first avatar. Don't know why. My first REAL (most likely permanent) avatar. Changed him into more of a bat p***. Why? No idea. --- Pixelation, because new-school just doesn't cut it. --- No idea why I changed it to this, probably because of all the D'AWWness. --- "Phoenix, I know you won't tell anypony about the blackmailing. Else, I will call the authorities for breaking and entering with that... 'special' pony..."
--- Valentines Day, every day. Awwwww yeah. -- New non-pony related avatar. 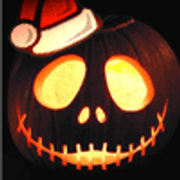 My current avatar, everybody had a hat so i made it. I'm really proud of it! It's the third sprite i ever made. new avatar stole from the flash game "Bazooka Boy" and edited a bit,i don't know why but i suppose i needed something new and fresh. -- When Super 0'Brothers was first announced, I made this avatar to promote it. It was also my first avatar. 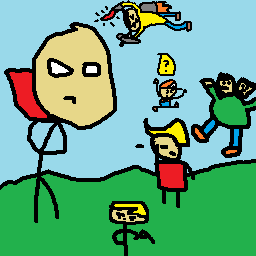 -- This avatar used a guy from my crappy comics I made in 5th grade that I made star in my first twitter avatar. I fitted him into the picture for his evil-ish role in Twatter Story. -- For Chapter 3, I was turned into a robot. This avatar that I made using GIMP at a library showed TurretBot, LF, and Nameuser, the halberd as Bonko's ship, plenty of anti-escalation down arrows, an anti-saso, and a question block from aforementioned twitter avatar. -- Christmas avatar. First animated avatar, aso the first with a portal. -- Yep gonna keep this one until March 3rd 2013. First avatar that isn't 100x100, except for the 0'Bros one. --- All Night Stabyourself avatar of kiashi's art. But I animated it. --- ^ < v game, you may or may not be missed. --- I recently learned how to code, so I made this. --- I tried to grab my DeviantArt avatar but I got this instead. --- FRICKEN TRIPLE HATTED TURRET DUCK!!! ---A replacement for my old TurretBot shrug (which was based off the pony shrug) that I'm also using everywhere else besides here. ---Miiverse allows you to post with a different expression on your Mii's face. So I made them into a gif and used it everywhere. ---This is the first time I drew TurretBot as a non-stickfigure. Traced from Super Mario World art. Also flight. --- --Scrapped icon for Outside The Box. Here's my (most likely permanent) avatar. I lost my green mario. --- Playing a game for 800+ hours grows on you. This is me in Spiral knights (Azure Guardian styled) with a fire level background. -- --Since I missed my 500posts count, I'm going to have to go with 555 instead. Oh well, 555 seems like a cool number, anyway! ---Son of the Sun. An end boss from Chrono Trigger. --- My newest avatar, the Ash of Agni. Overall it's pretty meh, but feel free to use it. -- Meow Meow, Imma Melonberry Kat. ---needed a basic avatar edited one of Mari0. --- edited one of Link so he has a portal gun. ---I don't know why I made this one. ---The Stick Dude with a portal gun. ---- Felt like making an animation from my two stick dudes. Also it's my first GIF. --- My Valentines Day avatar. --- Much better: A friendly alien standing on a guy. ---same as the old , but with more colors, and anti-aliasing. --- My Stabyourself OC, Stan the Stick, using a Portal Gun. -- Me grabbing cubes, because why not? --First animated one. I used the Mari0's custom skin for the Mari0 +Portal version of "Pop A Portal"
--Totally made with my mouse and Paint.NET. Ended up really cute (I think). --- First avatar I used. You all know him by now. --- Second avatar, portal based. Used for a good while. --- Used during the "No fun allowed" avatar fad. --- Second portal-based avatar. Used after I showed my custom Mari0 icon, and thought it'd look cool with my guy in it. --Made by TripleXero (I think) in the now defunct FightYourself IRC. --Had a game idea based around puppets. Made this as a challenge for that idea. Quite like how it turned out. --- Done with the Link costume, have a doll. --- It's a so called Awesome Face customized by me. It all started years ago when I saw the face, I fell in love with it and made an avatar... Then someday, one of my friends was like "I already categorize the Awesome Face as you" so I made it somekind of trademark specific to me. I made this avatar especially for Stabyourself.net forums. Also, Firaga (thanks again) helped me by making the eyes and mouth look rounder and better (it was my first attempt at spriting). My first avatar, though probably inaccurate because I had to recreate it. I only had it for about a day. I chose transparency over a green background. I randomly decided to invert my avatar. It reminded me of VVVVVV, so I made an avatar. I decided to change my avatar, but I liked putting my Mari0 character in weird places. I thought it would be fun to put him in a 3D game, and decided on Half-Life 2. My mouse broke, so I had to play games that didn't use it. I ended up playing a lot of Super Metroid, so I made an avatar. I wanted to make a Christmas avatar, but liked the theme of putting my character in strange places. LOFAF was the first good place I thought of. --- So much Oblivion; lots of Shivering Isles. -- I wanted to change my avatar; didn't keep it for long. -- Here's my chess piece, thanks to Firiga for the basis. ---Yay finally got around to making an avatar of my office like Turret did! -- It's related with the multi-dimension-thing. ---I should bring it to parties or wherever you bring beach balls. Last edited by Flutter Skye on 18 Apr 2014, 11:55, edited 60 times in total. I didnt have one so I stole an image off of some one else and made it into a meme. Ta-Da. is this really a good idea for a thread? can't people just look to the left of the post to see the avatar, and honestly who cares? do you even care about what jorichis avatar was? I think I agree with renhoek, although there is the fact that you have to write down reasons for choosing your avatar and the history of your avatars. What they are saying is it's kind of unnecessary to post your past avatars, because a good majority of the forum doesn't give to shits about what your past avatars were. I know I don't. see how you've put two of what's essentially the same avatar? Besides this stuff is trivial. EDIT: second image used to be different for those re reading this post. Last edited by renhoek on 12 Aug 2012, 15:33, edited 1 time in total. That was my old avatar, cause I was too lazy to get a real one. This is my new one. I made this avatar so I could talk about it in the forums. (it is a little small and hard to read). I changed to that one for reading issues. Just cause three others had a santa! Last edited by BobTheLawyer on 12 Aug 2012, 19:28, edited 1 time in total. Last edited by Chippy348 on 21 Oct 2012, 05:30, edited 6 times in total. LawnboyInAJar wrote: RWLab's avatar is everywhere. A wild random flashback appeared! And also so that I could be everywhere. Fapping Mario: I was playing Mari0 and I came across this. Being the immature f*ck I am I automatically switched to it. Large invisible block: I reverted back to this when everyone mistook me for Maurice. By the time Maurice got rid of that picture, I was feeling attached to this one. Probably here to stay. No fun allowed version of the large invisible block: because the "no fun allowed" is the huge rage. Last edited by RWLabs on 13 Aug 2012, 22:58, edited 1 time in total. Qcode wrote: I didnt have one so I stole an image off of some one else and made it into a meme. Ta-Da. I usually don't save avatars. I don't make them that often, anyway. My first ever art on MyPaint. Added a bit more text to spice it up a bit. I name it "Mario Hater". An animated version of my 2nd avatar. Too big for SYS forum. *Edit* Just finished this "Masterpiece" It is my pony OC. I call it Golden Pegasus. my current avatar, I got a pic of tim, a pic of a portal gun, and fitted them together. - Big thanks to LF for making this. My one now, I used paint.net to edit it and make it have I LIKE TRAINS! and a BONKO! GIF. Updated the first post, please upload the avatars to imgur.com , as if you give the link from the stabyourself.net site it will change when you change the avatar. EDIT: Yea, I know the maker of this thread is banned, so I'll just take over. any new avatars and/or avatars that have not been put into the first post will be in the next post. my current avatar will probably be lost since IDK where I put the avatar on imgur. Last edited by TheJonyMyster on 10 Feb 2013, 21:53, edited 16 times in total. Look to the left. I was feeling jolly! Edited due to the main post (by TheJonyMyster) being updated. Last edited by Mari0Maker on 31 Dec 2012, 06:25, edited 1 time in total. Legend_of_Kirby wrote: Look to the left. I was feeling jolly! Whew! Tons of work updating the post from my phone! TheJonyMyster wrote: Whew! Tons of work updating the post from my phone! I know, but at the moment, I had no choice. Last edited by Firaga on 21 Dec 2012, 02:00, edited 1 time in total. Just post my avatars, that are in the OP. Don't need to. They're already in a big post. Last edited by Legend_of_Kirby on 30 Dec 2012, 02:45, edited 1 time in total. Remake the one you made with this portal image, it's at least complete and doesn't look like a blatant steal-n'-edit case. And next time try finding your own portal image or something, I actually had to put a bit of work to getting that portal to look good. It was a blatant steal and I'll edit my post, I do admit that, Sorry. Last edited by TurretBot on 27 Jan 2013, 19:14, edited 4 times in total. got it updated. BTW guys, you can delete your posts after I update. They're just big and redundant. Turret, I kinda wanna see one of your old comics now that you brought it up. okay I'll go find one. Last edited by TurretBot on 03 Mar 2015, 02:31, edited 2 times in total.